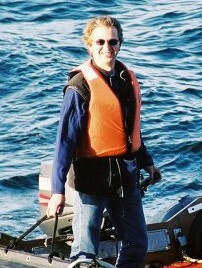 One of our guides on the September 2002 Circumnavigation of Newfoundland was the well-known folksinger Jim Payne. He handled a variety of tasks on this trip, ranging from piloting some of our Zodiac expedition rafts, to coordinating dances and singalongs, and performing music and recitations specific to each area that we visited around the island. Speaking personally, I was extremely impressed with Jim, not only as a performer who could deal easily with a variety of instruments, songs, musical styles and dances, but also as an astonishing individual and socially-aware culturalist. Plus he's just one of the nicest guys you could probably ever meet. In McCaffrey terms, he is truly a Master Harper. If you ever get a chance to travel with him or hear him sing, take it! You won't be disappointed. Barry Munro's Polar Star parody version, to the music of "Wave Over Wave"
Lyrics - For a song that Jim wrote during our voyage, as well as some information about our other onboard musicians. For more information about Jim's music and CDs, you can also check his professional site: Singsong Inc.